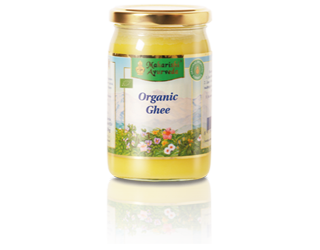 An integral part of Ayurvedic cuisine, ghee is the pure fat from butter. It balances the Pitta and Vata doshas. Savoured in small amounts, ghee stimulates the digestive fire. Ghee has been highly valued for centuries not only because of its health-promoting qualities, but also because of its subtle, nutty taste. It is ideally suited for cooking and frying. You can use it to prepare sophisticated, easily digestible dishes in no time. It intensifies the flavour of steamed vegetables. Spices roasted in a little ghee or deep-fried flat bread are delicious and enrich the diet.